Victoria Park,Newbury 2017 - Website of kennetaccordionorchestra! On Sunday 14th. 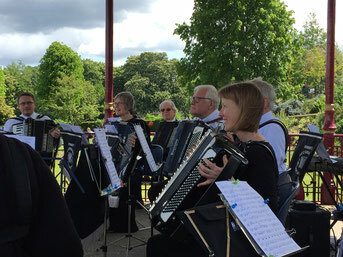 May the Orchestra played in the Bandstand at Victoria Park,Newbury. A nice sunny afternoon encouraged the audience to picnic whilst enjoying a mixed variety of music. We had many favourable comments from passing shoppers etc. who had never heard an accordion orchestra before.